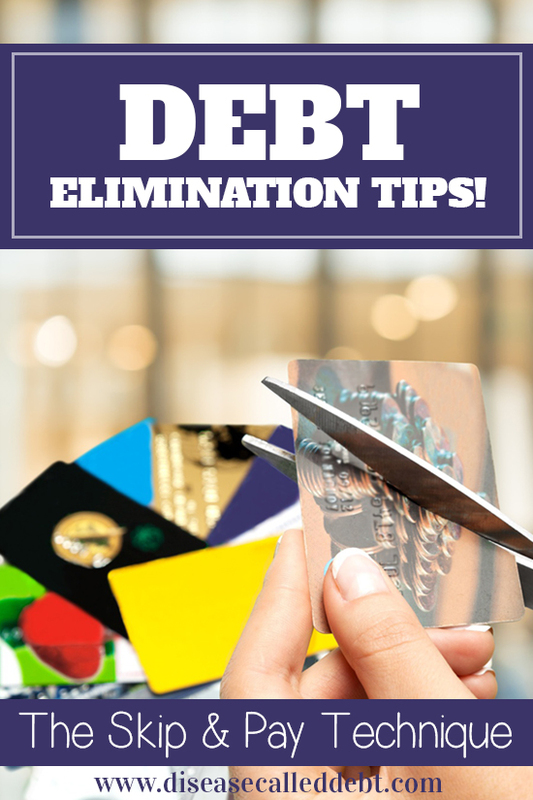 Welcome to another edition of Debt Elimination Tips – a new series here on the blog where I share with you my favourite quick tips for getting out of debt faster. If you missed the other posts in this series, you can catch up here. Today’s tip is about what I like to call the Skip and Pay Technique. When you’re getting out of debt, having and sticking to a strict budget is necessary. You’ll no doubt be cutting down on your luxuries if you’re really serious about getting out of debt, like getting rid of your gym membership or your digital TV package or simply not eating steak as often as you did before. There will inevitably come a point where you’ll think you can’t cut back any further unless you go without food – and I definitely wouldn’t recommend that. In order to stay the course with paying off your debt, you’ll need to make sure your budget is realistic and allows for you to have the odd lunch out or so you can buy that coffee on the way to work without feeling guilty. When the hubby and I were paying off debt, we allowed ourselves £50 per month total as a family to spend on socialising. For us, that included going out for a coffee or to the pub now and then and taking our daughter swimming or to a playgroup. If we hadn’t done that, we surely would have failed in sticking to our budget and that in turn would have led to us being demotivated time and time again. So with your realistic budget set, you can go about life paying back what you can on your debts and knowing that you’re in full control of your spending. Here’s where the Skip and Pay technique comes in to help you pay your debts off faster. It’s all about having choices and being in control. The Skip and Pay technique is where you consciously decide that you don’t need to spend money on that item that you’ve budgeted for this month and use the money that you’re saving to pay off your debt instead. Let’s say that you’ve allowed yourself a little spending money one month to go out for a special dinner. You don’t go out very often, so you’re looking forward to it and have planned for it in your budget so there’s no need to feel guilty. You go for dinner, have a starter and a main course and feel quite satisfied. Then the pudding menu appears and you can decide whether to play the Skip and Pay card. Do you need a pudding? Do you want one? If you do, that’s fine! But if you feel like skipping it to put your money to better use, well – you could just pay off your debt with that money instead. It doesn’t matter if it’s just a small amount of money that you’ll be paying off – it all adds up and sooner than you think. Do it straightaway as soon as you get home. You’re doing your monthly grocery shopping and you’re working to your usual list and your budget for this area. You expect to spend £200 on food, household items, toiletries etc. with a couple of top up shops later in the month. Why not try this technique by skipping your usual brands and buying value brands instead for items that you wouldn’t normally do this for. Could you skip your regular shampoo and conditioner and buy a value one instead? Or even make your own cheaper version? Do you even need to top up on all your toiletries? (Check your stock before you shop!) If you can skip certain items, you can use the money you save to pay off your debt. For this technique to work effectively, you need to pay the money you’ve ‘found’ towards your debts the same day. If you don’t do that, there’s a chance that your savings could just be used to mop up the grey areas of your budget, never to be seen again. This is a really good way of overpaying your debts without feeling like you’ve squeezed your budget into oblivion. Psychologically, you’ll feel as though you’re achieving success with your debt repayment without making things extremely tough on yourself. As I said earlier, it’s about being in the driving seat and consciously choosing to make sacrifices when you don’t absolutely need to. 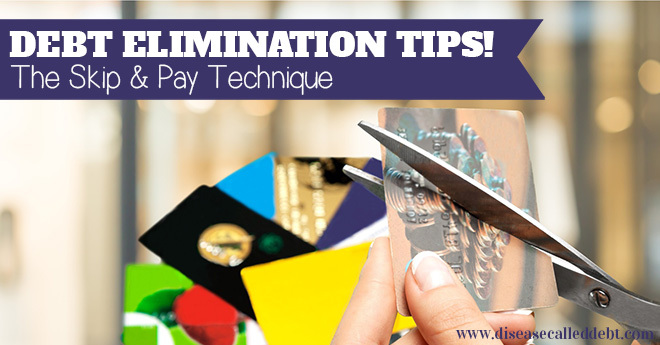 I hope you found this debt elimination tip useful! Maybe you’ve tried this before? Let me know in the comments below. Don’t forget to follow my paying off debt board on Pinterest for plenty more tips like this one! Scenario # 1 is really doable. I would also skip pudding, which is I always have and consider not-my-favorite. By doing this, I can add something, even it’s a small amount, to my savings. This is really a good technique…. Thanks Jayson! All those small amounts really do add up. The trick is not to let the savings get mopped up by something else. If you can give the money you save a purpose i.e. paying off debt, then you’ll see results really fast. That sounds like a pretty nifty trick you’re so right it would definitely not feel constricting. To me paying off my debt was just so motivating it wasn’t a sacrifice to give up stuff. Yes I know what you mean – there’s nothing better than seeing those numbers coming down! Interesting idea! This could be a great way to throw some extra money here and there at debt. This is such a powerful one. Like you said, you have to do it the same day or the dedication wears off and that money gets absorbed into another part of the budget. But we’ve definitely used it to reach savings goals before. Great post. Thank you! 🙂 That’s great that you used this method to increase your savings. I’ll be doing that from now on! Love this idea, Hayley! We often come in under budget on things, but then I think that money just ends up going other places, you know? I think we need to have a solid plan like this for using that under-budget cash. Really cool ideas. I like both scenarios actually. If you’re smart and know how to indulge with some things that are more important and how to be frugal in others, you can save more money to pay off debt or do whatever you wish to. Using the “extra” and applying the payment the same day is def the key to this tip. If I have extra and I don’t use it for debt or savings right away, I find that I usually end up spending it on something else I don’t need instead. Yes – that’s exactly what I used to do too! Using the savings fast is the best thing to do here and you’ll see a difference in your debt total before long!